YouTube is a digital marketer’s friend. YouTube is a search engine and, therefore, is interested in keeping searchers within its network so that it can show those searchers ads. As a result, YouTube sends traffic to videos that are keeping YouTube visitors engaged on its site. Here’s how to get more search traffic to your videos on YouTube. The YouTube search engine measures how many people see your video in their search results against the number who play your video. If your videos get played often, YouTube rewards them with higher rankings. The most important factor in increasing the number of plays that a video gets is the video thumbnail, which is the image searchers see for the video in the YouTube search results. A compelling thumbnail can have a big effect on your click-through rate and, thus, your rankings in YouTube. Each video image is a thumbnail. To engage your audience, make sure that your thumbnails are bright, vibrant, and crisp. Include compelling text for each thumbnail to tell viewers about the content and to entice them to click or tap it. If you don’t have a graphic designer, you can create professional-looking thumbnails with a tool called Canva. This tool offers many free and paid templates you can use. Also, you can import your own images into Canva to create thumbnails that set your videos apart. 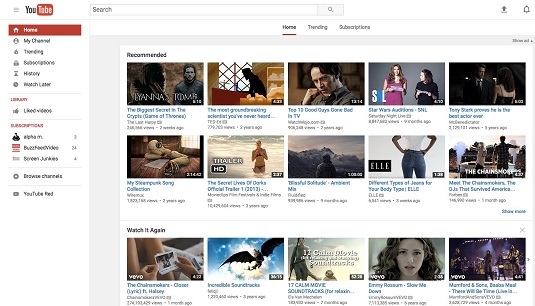 YouTube’s goal is to keep searchers within the confines of YouTube so that it can show ads to those searchers. The number of shares, views, and comments your videos receive indicates to YouTube how well your videos are keeping searchers engaged. In addition, a video with lots of views, more likes than dislikes, and favorable comments proves to new viewers the quality of the content. Good quality leads to more likes and shares. In the description and in the video itself, be sure to ask viewers to like, comment, share, and check out more of your videos. Like your website, your YouTube videos need to be optimized for keywords. Make sure you include the keyword(s) or keyword phrase(s) in the video’s title, the description, the tags, the filename of the video file you upload, and the video you create. This practice helps users find your video and improves your rankings and relevancy on the YouTube platform. To gain more insight into your score, as well as other metrics, you can use a tool like vidIQ to track and manage your channel. How long people watch your video is known as audience retention, which is an important metric to measure. 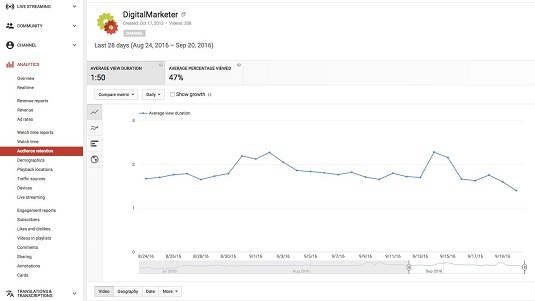 The YouTube reporting suite allows you to view retention metrics. Examining video retention in YouTube. It’s normal for a video to gradually lose viewers; not everyone watches a video the whole way through. That said, pay attention to audience retention on outlier videos that do very well or very poorly. Attempt to determine why some videos have high retention while others have trouble holding people’s attention. Then optimize and change your video content accordingly.